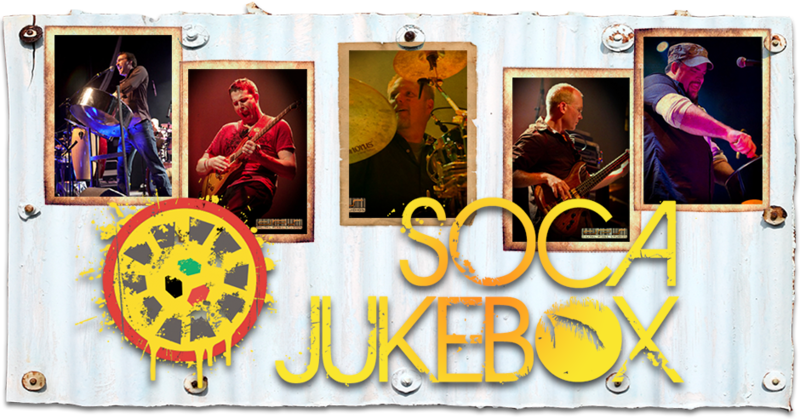 Island Rock extroverts, Soca Jukebox is one of the genre’s premier show bands. This five-piece ensemble features a battery of shimmering steel pans, an array of Latin percussion, a fastidious rhythm section and incendiary guitar work. SJ’s cast of trained professional musicians are multi-instrumentalists and engaging performers dedicated to “bringing the party”. A live Soca engagement showcases five decades of well-known repertoire from diverse musical genres. Their great song selection, top-shelf vocal talent with smooth harmony and tribal chanting offer sanctuary in an all-out Drum War. Soca Jukebox is one of the top band choices for national corporate entertainment! it is interactive with your audience and appeals to all ages and musical tastes. Their crowd-pleasing unique blend of Island-Rock covers everything – classic hits in Rock, Reggae, Country, Calypso and Soca (“SO-ul CAlypso”). This five-piece ensemble features a battery of shimmering steel pans, an array of Latin percussion, a fastidious rhythm section and incendiary guitar work. It’s a musical getaway that is uplifting and entertaining, a perfect fit for your corporate event. Soca Jukebox is available for, Client/Employee Banquets, Incentive Programs, Holiday Parties, New Year’s Eve events, Annual Galas, Product launches, Community Concerts, Festivals and so much more! Soca Jukebox comes complete with full back-line, lighting, and a pro sound company for your corporate event. It is available to travel anywhere! From their Kansas City, Missouri home base. The ensemble is a nationally touring corporate entertainment group that travels coast to coast.